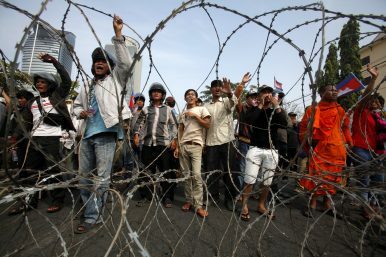 Protesters shout near the Council of Ministers during a demonstration in central Phnom Penh December 30, 2013. Cambodian opposition supporters, backed by striking garment-factory workers, rallied to demand long-serving Prime Minister Hun Sen step down and call an election. As democracy is dismantled, will Cambodians return to the streets? When tens of thousands of opposition supporters took to the streets of Phnom Penh shouting “Hun Sen, step down!” in wake of the disputed 2013 general election, it was the biggest threat to the prime minister’s power in a generation.